Past the Jetty and further down the harbour you come to the chilled out Island Bar, with a lot of space out front with about 20 tables outside with metal chairs covered in British racing green cushions and a row of low wooden sofas along the wall of the building under the shade of the second storey. Friday nights they generally have live music playing and is very popular so if you want to go it's worth booking a table then. They do food too, and specialise in Mexican and Thai food, and although I've never gone there for a full meal, a plate of cheesy nachos has gone down well with a drink at times. There a few staff that work there including Sarah who, after trying my best Taverna Greek on trying to order, I found out is actually a Scot. There's also plenty of space inside to and there's a back entrance into the bar from the little shopping street that winds up to the Castle. Next to this door they sell ice creams to passers by too. 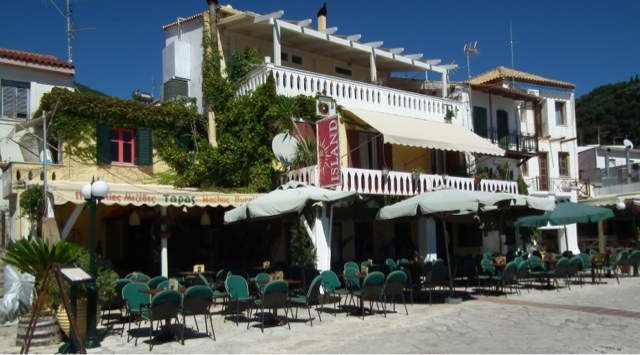 It's is a regular stop for me when I'm in Parga, and is also one of the bars that stays open out of season through the winter.